Gaffer for a day Mark Harvey, 57, from Launceston, Cornwall, gives his thoughts on Pompey’s 1-1 draw at Plymouth. Was a 1-1 draw a fair result? I said in my pre-match preview that I would take a point based on the form guide going into the game. A draw is a good result and there were some positives. We played some better football, defensively we looked sharper and apart from taking the ball from the back of the net Craig MacGillivray didn’t have anything to do. Plymouth had a lot of possession but didn’t really hurt us. There were signs Pompey are getting back to their old selves. A few decent results and we will get back on track. I am disappointed we didn’t win the game after going 1-0 up. How many times have we been at Fratton Park, teams have took the lead then shut up shop? We seemed to keep going for the second goal, which is great if it comes. I don’t know if it Plymouth deserved a free-kick that led to Graham Carey’s equaliser. But Yann Songo’o was going across the box and away from the goal – I wonder if Nathan Thompson had to make the tackle. Then I thought Oli Hawkins should have been on the far right-hand side of the wall because you know what Carey is going to do. And when you see the highlights you question the starting position of Craig MacGillivray. We were better than we have been but there’s still room for improvement. Do you think Kenny Jackett should have made more than one substitution? Jackett has got Viv Solomon-Otabor on the bench and I’d have played him for the final 15 minutes to give Plymouth the run around. I’d have told him to stay out wide and tried to get the ball to him. He’s come with a bit of a reputation of a speed merchant and could have gave us a bit extra. Solomon-Otabor is also a bit unknown to Plymouth and they may not have known how to deal with him. How did you rate wingers Ronan Curtis and Jamal Lowe’s performances? Every time they got the ball, Curtis in particular, Carey tracked back and almost became a second full-back. The same happened with Lowe and they were always in two-v-one scenarios. People are starting to see how we play and know so much comes from the wide men. Our most potent threat down the wing was when Gareth Evans got down the flank because there wasn’t two men marking him. Curtis looks jaded while they’re not getting the ball to Lowe in the right places. But, to be fair, when do wingers come into their own this time of year? Do you think Jackett needs to freshen up his starting line-up? I’d hold off on that before we play a few games with Oli Hawkins back in there. He holds the ball up and brings the wingers and Gareth Evans into play more. 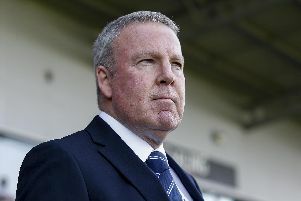 Kenny Jackett tends to stick to the same team and that was positive at the start of the season. The boss knows the players he wants in each position. Christian Burgess has had unjustified stick recently and always goes out and gives 100 per cent. It was a difficult day for centre-halves and both he and Matt Clarke were excellent. Burgess just got the nod because Clarke uncharacteristically made a couple of mistakes.